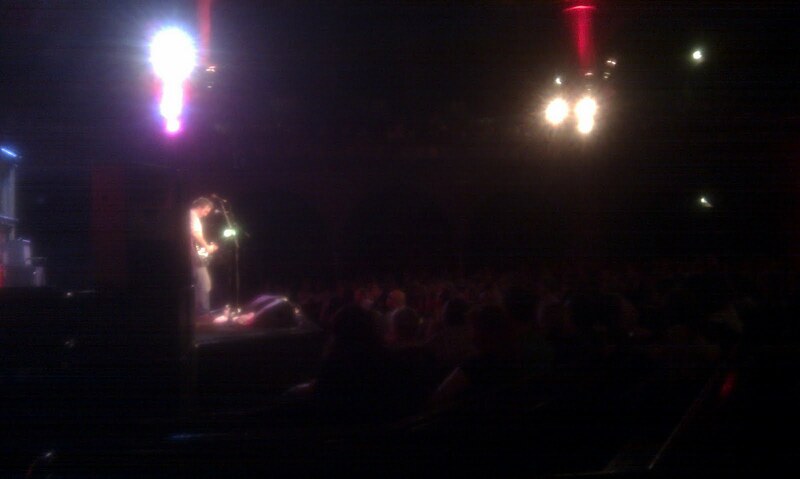 The Union Chapel has to be one of the most picturesque venues in London. Candles light the upper balcony & the corners of the stage, the stained glass windows are beautiful and the acoustics are perfect for, well, acoustic. It makes you feel like you’ve arrived at Christmas eve Midnight Mass – but without all that God stuff. As it turned out, tonight’s concert – Willy Mason, The Staves (main support) and Dan Lefkowitz (first support) felt near religious anyway. And not just for me. The guy to my right was adamant he was having some sort of divine experience as a consequence of the music. And I have to say, I believed him. No drunk would move their legs and arms in such a fervent manner. First up – Dan Lefkowitz – is an out and out folk singer. Dan sounds alot like Bob Dylan, but without the same lyrical clout. He plays guitar well and his harmonica was breathtaking in parts, but I have to admit I just felt something was missing. Perhaps his songwriting just didn’t hold up compared with his musicianship but I have to admit I started counting down the minutes before the next act would be with us. The Staves are three (very) English sisters that sing americana/folk full of harmonies and middle-class charm. Think Jenny Lewis & The Watson twins, if they’d all grown up in Oxford. Emily, Jessica and Camilla (obviously) Staveley-Taylor play and sing as one – it was a real treat to hear their powerful vocals echo around the chapel. This really is the kind of venue their music was made to be played in – the acoustic bring huge depth to their performance that you just wouldn’t find elsewhere. The girls were in their element for the entire set and are definitely ones to watch. Outstanding. After (foolishly) getting up to go to the bar, I lost the fantastic view I had and ended up perching on a pew at the side of the chapel. Not the best I’m sure you’ll agree. Willy’s fantastically gravelly voice has this amazing cut through – you can imagine him filling any room he plays. It’s distinctive, unforced and plays to the melancholy of his music perfectly. His guitar really growled and his songs took off in a way I’d never have expected them to from listening to his CDs. Even sans rhythm section, he managed to play with an intensity that many bands dream of and walking out of the gig I couldn’t wipe the smile off of my face. A truly fantastic singer-songwriter. He really should be so much bigger than he is.